Newspaper Rock: Paul Frank's racist "powwow"
By Jessica R. MetcalfeThe other day, I got a Google alert that an article was written using the words "Native American" and "Fashion." It turns out, the article was about Paul Frank's Fashion's Night Out party. The description was only two sentences long, but I learned enough to realize that something bad was going down. 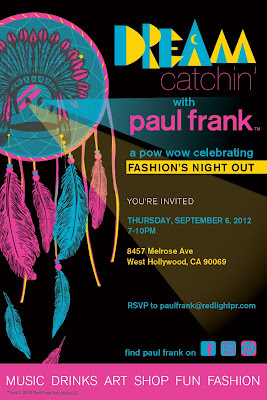 "Paul Frank celebrated Fashion’s Night Out with a neon-Native American powwow theme. Glow-in-the-dark war-painted employees in feather headbands and bow and arrows invited guests to be photographed on a mini-runway holding prop tomahawks." So, I searched for him on Facebook, and sure enough, he had posted over 1,000 images from his powwow party. I posted this picture (above left) on Beyond Buckskin's Facebook page, with the caption, "Oh good. Mock scalping. And here I was, worried that Native American people were underrepresented in the fashion industry." And many of you responded. So many people reacted to the obvious racism, and posted on Paul Frank's wall, and reported the images as 'Racist', that within 24 hours of that first image post, the entire albums were removed from Paul Frank's FB page. My name is Adrienne K., I am a citizen of the Cherokee Nation, and I write a blog called Native Appropriations. 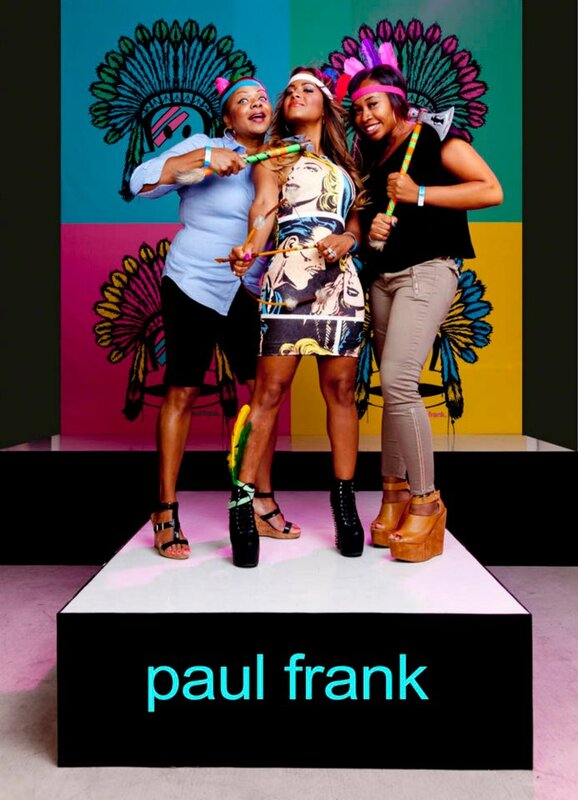 I write about representations of Native people in the media and popular culture, and last night (9/8/2012), photos from your Fashion's Night Out event "Dream Catchin' with Paul Frank" were brought to my attention. I am extremely troubled and concerned with many aspects of the event, and I honestly felt like someone had punched me in the stomach when I first loaded the photos posted on your Facebook page. To begin, the image of the Paul Frank monkey in "warpaint" and a headdress is incredibly problematic. Headdresses are considered sacred in Native communities and are reserved for the most respected and revered leaders. To place one on the head of a monkey trivializes the sacred and respected nature of the warbonnet, and paints Native people as sub-human. There is an entire painful history of people of color being equated with primates, and images such as this echo to that past. I've written an entire post about why wearing "hipster headdresses" is offensive, which can be found here, and breaks down the argument more completely. In addition to the monkey imagery, party goers were encouraged to "play Indian" with plastic tomahawks and bows and arrows, resulting in photos of fake "scalping," "war whooping," and other extremely hurtful stereotypes. I have also written extensively about the issues surrounding "playing Indian" and dressing up as Native peoples for Halloween and other theme parties. This practice is exactly akin to providing props for party guests to dress in blackface for photos, a practice that I'm sure would not bode well for your brand. Powwows in Native communities are social events, but are also spiritual and closely tied to traditional culture. Photos from your event show a sign on the bar reading "Pow wow and have a drink now!" 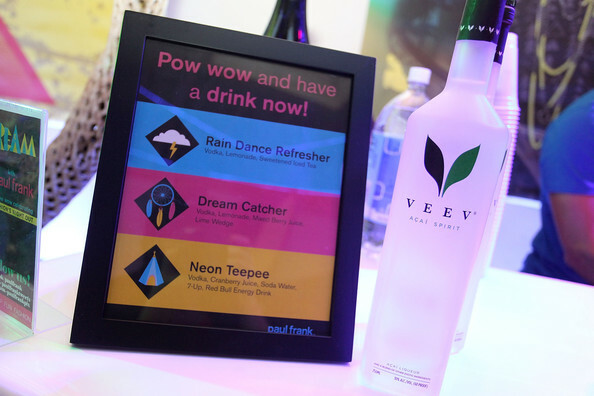 with drinks called "Rain Dance Refresher," "Dream Catcher," and "Neon Teepee." The vast majority of contemporary powwows celebrate sobriety and are very explicit about the prohibition of alcohol and drugs on powwow grounds. To associate the consumption of alcohol with a powwow is disrespectful, especially given the history of alcoholism in our communities. There were also many children at the event, and your celebrity appearances were tween Disney stars. As a result, now these children in attendance are being acculturated into thinking that Native peoples are one-sided stereotypes of feathers, warpaint, and weapons, and that playing Indian is perfectly acceptable and fun. My young cousins worship anything to do with these starlets, and I know there are many other young girls who do the same, and that worries me to no end. The bottom line is this: your event stereotypes and demeans Native cultures, collapsing hundreds of distinct tribal and cultural groups into one "tribal" mish-mash, thereby erasing our individual identities and contemporary existence. Until 1978 with the passage of the American Indian Religious Freedom Act, Native peoples could be arrested for practicing traditional spirituality--many aspects of which you mocked in your party theme. While the theme may have seemed "fun" and "playful" to you, to me as a Native person, it just represents our continued invisibility. When society only sees us as the images you presented, it means that our modern issues of poverty don't exist, nor do our modern efforts like schooling and economic development through sovereignty and nation building. We have sophisticated tribal governments and communities, but how will we be able to be seen as modern, successful people if we are continually represented through plastic tomahawks and feathers? You may have mental images of Native people stuck in the historic past, sitting around in tipis and smoking peace pipes, but if last night's reaction on Twitter and Facebook showed you anything, I hope it showed you that we are contemporary peoples who enjoy fashion and fun, but don't tolerate when our cultures are stereotyped and sacred aspects are trivialized. We don't all run around with tomahawks and bows and arrows, or war whoop and say "how." We do, however, mobilize as a diverse yet connected community through technology, and continue to fight for our living cultures to be celebrated in respectful and meaningful ways. While I commend you for taking down the thousands of photos from the Paul Frank facebook page, I encourage you to issue an apology or statement surrounding the event, and let us know how you plan to remedy the situation. Hundreds of Native people and allies responded to the photos last night, and we are all waiting to hear from you. Mere minutes after my post went up, Paul Frank issued this apology on their Facebook page:Paul Frank celebrates diversity and is inspired by many rich cultures from around the world. The theme of our Fashion's Night Out event was in no way meant to disrespect the Native American culture, however due to some comments we have received we are removing all photos from the event and would like to formally and sincerely apologize. Thank you everyone for your feedback and support.The fact they apologized is good, but clearly it's the classic "sorry you were offended" rather than "sorry we were offensive" response. They should read this post next time. But baby steps, I guess?Comment: Indian Country Today summed up the controversy in Paul Frank Offends With ‘Dream Catchin’ Party. All three links include lots of photos of the offenders. It's amazing that people still don't get the blackface/redface parallels. These days you don't dress up as members of any minority group--not as Mexican peasants in ponchos and sombreros, Chinese peasants in coolie outfits, etc. And obviously not as blacks in shoe polish and Afro wigs. But this party is exactly the same thing, and people do it without a second thought. Having a racist attitude toward Indians--"they're primitive and savage"--is totally mainstream in our society. And this party took place in supposedly enlightened West Hollywood. What a great example of hipster ignorance and apathy. You can bet Paul Frank and company aren't even aware that Native peoples and cultures still exist. Which shows us that we have our work cut out for us. America still needs to be educated on the realities of Native history and culture. For more "Indians" parties that exemplify hipster racism, see University of Denver's Cowboys and Indians Party and Duke's "Pilgrims and Indians" Party.